In the village of Semigorye on the Volga River, there is a boulder. On it is a plate that reads: “On this spot a Technical Sports Center will be built.” Apart from the plate, there is no evidence of the center, but the lack of infrastructure did not prevent the first snowcross world championships in Russia from taking place there. The stands and the slopes along the track were filled with spectators hopping from foot to foot in the freezing temperatures. Behind them were tents offering kebabs and hot tea. The tickets for the championships were quite expensive: 300 rubles ($10) just to get into the enclosure, and 1,500 ($50) for a seat on a hastily erected stand with plastic seating. Yet despite the cost and the freezing weather, between 4,000-5,000 winter technical sports fans gathered in Semigorye. Snowcross, which made its debut in 1998 at the X Games, is essentially overcoming obstacles on a circular track at high speed; it is a succession of jumps over special snow mounds, slopes and sharp turns. The .8 mile track has no straightaways where the racers can develop maximum speeds. That is possibly why the sportsmen only managed to race their snowmobiles at speeds up to 32 mph. Each heat lasts 15 minutes. There are 20 snowmobiles on the track, so collisions are common, especially when the snowmobiles fly from the start at full speed into the first corner. Finnish competitor Jussi Honka was injured in one of these incidents – he had to be sent to the local hospital with a suspected serious concussion. There were far more minor injuries, bruises and strained muscles. Several times racers lost control and flew into the snow, but their machines were waiting for them close by – the ignition key was attached to the driver’s overalls and stopped the motor. After a one-year interval, the 27-year-old American Tucker Hibbert has regained his title as champion after an incredible display of skill. He managed to salvage what seemed to be a total loss in the first race after messing up at the start: he was in 19th place, but finished second. In the subsequent heats no one could match him. In addition to the cup, he received 30,000 euros in prize money. He spoke with Russky Reporter about his win. Russky reporter: What would you like to say about the organization of the competition? Tucker Hibbert: Everything looks excellent to me. The organizers haven’t just tried to get the track ready, they’ve also taken care of the teams and the press. RR: Have you had the chance to visit Russia before? T.H. : No, but I like it here. It’s totally different to everything I’ve seen before, but my impressions are exceptionally good. RR: Have you met any of the Russian racers before? T.H. : This is the first time I’ve met most of them. I’ve had to compete against Russians a couple of times at races in the U.S.. So we’re meeting on the track and seeing how everyone’s driving. Of course, they’ll want to exploit their home advantages in the championships. RR: How do you get on with the other racers? T.H. : We know each other well, and I try to maintain good relations with all of them outside the races. But when we’re competing I usually shut in on myself and focus on my own issues. RR: Is snowcross a tough sport? T.H. : Tough isn’t the word for it! The racers have to do a lot of preparation for the competitions and have to be very careful on the track so as not to get injured, and they also need strong nerves: if you start to panic you’ll make a fatal error. We also have to keep an eye on the machines – so they don’t break down during the race. RR: How many people are there in your team? T.H. : There are four of us here, including my father. But that’s not many – back in the States I have a lot more people travelling with me. RR: How many races do you do in a season? T.H. : I take part in 10–12 big international competitions, and also in maybe three or four regional ones. RR: Is this type of sport popular in the U.S.? T.H. : Very. 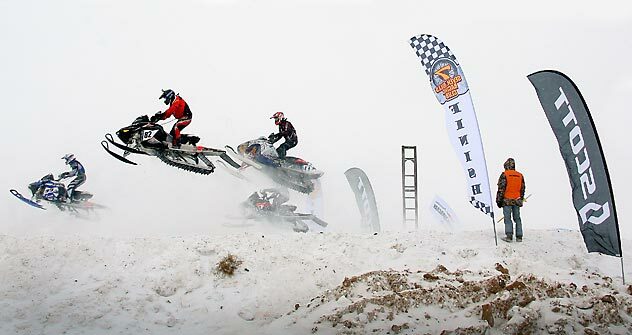 There are various types of snowmobile races, including ones on a closed track and long distances across open ground. But in Europe, especially Scandinavia, lots of people are interested in this sport as well. And here too – you just have to look at the crowds on the stands.